Four Mighty Layers for our Mighty Fighting Tiger Fans! This is a BIG bow that will match any Tiger Fans shirt or cheer outfit. The bottom layer is a huge 4" white grosgrain ribbon that is topped with a 2.25" purple grosgrain ribbon. Then a 1.5" yellow gold ribbon is topped with a 7/8" satin white ribbon that has purple letters of "LSU TIGERS". 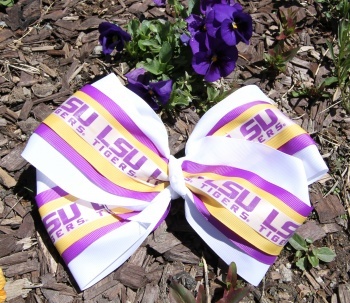 This bow must be taken with you to the next LSU game!